Electronic documents are a mundane yet integral part of the financial industry, as they improve operational efficiency, reduce costs and save paper for banks and credit unions. Members also enjoy the convenience they offer, as they are able to sign disclosures and send the document back from their mobile phone or computer. Electronic Signing is a key feature allowing members to agree to the terms of documents without a trip into their credit union's branch. Electronic signatures carry the same legal weight as paper documents thanks to the Electronic Signatures in Global and National Commerce Act (ESIGN), which went into effect on October 1, 2000. For this reason, eSignature is the preferred method for both members and CUs alike for its convenience. However, there are particular rules and regulations regarding ESIGN to which credit unions must abide. 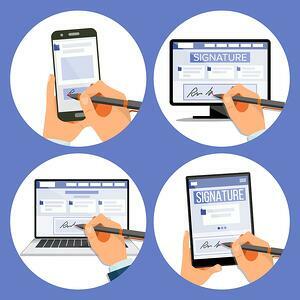 Here are important compliance guidelines to keep in mind when implementing eSignature options. As required by FCU model bylaws, applications for membership must be signed by the applicant. A handwritten signature is not mandated, meaning eSignature is an accepted and approved option according to these bylaws. However, the credit union needs to have audit and verification procedures in place in any document where a member's signature is captured electronically. When using electronic signature, both the member and credit union need to understand that the action they’re taking is formalizing an agreement. While not required, an electronic signature-verification service like DocuSign will help to authenticate the signature and ensure both parties are aware that, upon signing the document, it becomes a binding agreement. Unlike member applications, a signature is not required by federal regulations for credit applications. It’s still important to check state laws here because some have added regulations requiring credit unions in that state to obtain signatures for credit and loan applications. Furthermore, some institutions require a signature as a means of protection for members to help prevent identity theft on such applications. Although, there are some situations that may require a credit union to obtain a signature in relation to credit card applications. Regulation Z of the e-CFR states that credit unions must obtain a signed agreement for co-signer or joint applications where the member is under 21. This regulation was specifically designed to prohibit the offsetting of credit card debt with shares on deposit, except in situations where the credit union has obtained a consensual security interest in the funds. Credit unions can also require a signature to establish a consensual lien or maintain a consensual lien or pledge on a members’ shares for their credit card account. Additionally, the Fair Credit Reporting Act (FCRA) does not require that credit unions obtain a signature in order to pull a member’s credit report. The act simply asks that the credit union have a permissible purpose, but there are certain employment-related circumstances that may require a signature in order to pull the report. Again, states can enact their own rules and procedures as well, which may require an applicant’s signature to authorize the credit report. When it comes to eSignature compliance, the key is understanding both federal, state and local regulations. States can create their own eSignature policies, so it is essential to become familiar with the requirements on both a national and local level. Once your CU is clear on the regulations, setting up an electronic signature platform will allow members to sign and authenticate documents quickly and easily. eSignature options will make your credit union more efficient and convenient without compromising your credit union’s legal standing for electronically signed documents.